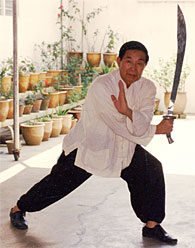 Note Concerning transference of correctly practiced Forms, Styles and Disciplines of Traditional Gong Fu lineages in the post 1949 world. ‘Do not alter the arts I have taught! They are not my arts, nor yours, nor even my masters and their masters, masters, but belong to the lineage, Not to a single person! This injunction was more than once uttered in earnest by Shizu Chee Kim Thong, when confronted with suggestions that a degree of alteration to the Arts could be desirable and acceptable. While he was deeply honoured through having the title ‘Living National Treasure of The Peoples Republic of China’ (bestowed in 1989), he felt that the most important work he could do to reciprocate this honour was to strive to maintain the integrity and purity of the Arts in their true pre-1949 forms, preserving them for posterity from the many challenges to their authenticity and accuracy that existed – and remain – during the final years of his life. It was in order to preserve the traditional arts from becoming corrupted by piecemeal or major changes, that Grandmaster Chee accepted the request made to him by the government of the Peoples Republic of China, to return the Arts to the land of their origin. An additional consequence of this decision witnessed Grandmaster Chee Kim Thong as a benefactor to his native land of Fujian, through contribution to many public works there, including assistance in the renovation of the Shaolin Temple, as well as help for the needy. [Grandmaster Chee Kim Thong, in the Malaysian Straits Times, ‘Sunday Style’ Interview: May 3rd, 1998].